Tears and expressions of grief met the opening of the nation's first memorial to the victims of lynching Thursday in Alabama. Hundreds lined up in the rain to get a first look at the memorial and museum in Montgomery. The National Memorial for Peace and Justice commemorates 4,400 black people who were slain in lynchings and other racial killings between 1877 and 1950. Their names, where known, are engraved on 800 dark, rectangular steel columns, one for each U.S. county where lynchings occurred. A related museum, called The Legacy Museum: From Enslavement to Mass Incarceration, is opening in Montgomery. Many visitors shed tears and stared intently at the commemorative columns, many of which are suspended in the air from above. Toni Battle drove from San Francisco to attend. "I'm a descendant of three lynching victims," Battle said, her face wet with tears. "I wanted to come and honor them and also those in my family that couldn't be here." Ava DuVernay, the Oscar-nominated film director, told several thousand people at a conference marking the memorial launch to "to be evangelists and say what you saw and what you experienced here. ... Every American who believes in justice and dignity must come here ... Don't just leave feeling like, 'That was amazing. I cried.' ... Go out and tell what you saw." As for her own reaction, DuVernay said: "This place has scratched a scab. It's really open for me right now." Angel Smith Dixon, who is biracial, came from Lawrenceville, Georgia, to see the memorial. "We're publicly grieving this atrocity for the first time as a nation. ... You can't grieve something you can't see, something you don't acknowledge. Part of the healing process, the first step is to acknowledge it." The Rev. Jesse Jackson, a longtime civil rights activist, told reporters after visiting the memorial that it would help to dispel America's silence on lynching. "Whites wouldn't talk about it because of shame. Blacks wouldn't talk about it because of fear," he said. The crowd included white and black visitors. Mary Ann Braubach, who is white, came from Los Angeles to attend. "As an American, I feel this is a past we have to confront," she said as she choked back tears. DuVernay, Jackson, playwright Anna Deavere Smith, the singing group Sweet Honey in the Rock, Congressman John Lewis and other activists and artists spoke and performed at an opening ceremony Thursday night that was by turns somber and celebratory. Among those introduced and cheered with standing ovations were activists from the 1950s Montgomery bus boycott, Freedom Rider Bernard Lafayette, and one of the original Little Rock Nine, Elizabeth Eckford. "There are forces in America today trying to take us back," Lewis said, adding, "We're not going back. We're going forward with this museum." Singer Patti Labelle ended the evening with a soulful rendition of "A Change is Gonna Come." Other launch events include a "Peace and Justice Summit" featuring celebrities and activists like Marian Wright Edelman and Gloria Steinem in addition to DuVernay. The summit, museum and memorial are projects of the Equal Justice Initiative, a Montgomery-based legal advocacy group founded by attorney Bryan Stevenson. Stevenson won a MacArthur "genius" award for his human rights work. 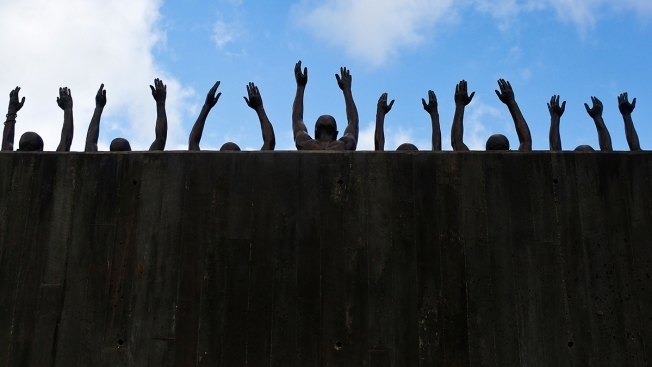 The group bills the project as "the nation's first memorial dedicated to the legacy of enslaved black people, people terrorized by lynching, African Americans humiliated by racial segregation and Jim Crow, and people of color burdened with contemporary presumptions of guilt and police violence." Several thousand people gave Stevenson a two-minute standing ovation at a morning session of the Peace and Justice Summit. Later in the day, Edelman, founder of the Children's Defense Fund, urged the audience to continue their activism beyond the day's events on issues like ending child poverty and gun violence: "Don't come here and celebrate the museum ... when we're letting things happen on an even greater scale."